« Do video producers need a publicity release waiver? Can you shoot video or take a photo of a street artist in public — and post it on your blog? Are you allowed to shoot video or take a photo or record music of a musician or street artist performing in a public place and post it online? The two problems arise under section 1101 of the Copyright Act and the criminal anti-bootlegging statue that Congress passed a number of years ago (Title 18 USC 2319A). Section 1101 requires “consent of the performer” if you “fix the … sounds and images of a live musical performance” (which is what you’ve done in making the recording, assuming it’s a “live musical performance”). It also would require consent if you “transmit … to the public” (which is what your blog would do). In the criminal anti-bootlegging act, the definition of “trafficking” requires a transfer of the bootlegged performance “as consideration for anything of value.” This suggests to me that if you’re doing this non-commercially, then you’re not providing the copy on the blog “as consideration for anything of value” and thus not in violation of the criminal act. So I think you’re in the clear on this one. BTW, this criminal act is the subject of some recent litigation. The Act arguably violates the copyright clause of the Constitution because it gives someone a time-unlimited right to control a public performance (it’s a limited times argument). This issue is working its way up through the federal courts as we speak. (2) He may try to claim a right of publicity, but I think you’re safe on that for two reasons (at least under California laws): (a) he’s performing in an entirely public place without any restrictions, he sees that people are photographing him and taping him; (b) your use is “not commercial” (speaking conservatively, this means that you receive NO $$$ from the blog that is hosting the tape). The Right of Publicity in California extends only to commercial uses of one’s identity/image/likeness/voice etc. A third reason may be applicable: (c) There’s an exception to the Right of Publicity for “any news, public affairs, or sports broadcast or account, or any political campaign.” To my knowledge, this has not been tested legally, but if your blog is considered “news reporting” then you’d fall w/i that exception, or, if the street musician is a political candidate you’re definitely in the clear. (3) This is a bit of a stretch, but the performer may claim trademark interests. For example, if he’s wearing clothing that identifies himself and his trademark for services (performaces?) he provides, then your putting them on your website might suggest an affiliation with him. The key for TM infringement is likelihood of consumer confusion. Unless you’re a competing performer and putting a video of him on your blog (e.g., to suggest an affiliation/endorsement by him), then you’re not going to even come close to consumer confusion. • Do video producers need a publicity release waiver? • U.S. Code collection: Title 18 — Crimes and Criminal Procedure (Cornell University Law School)JD Lasica, founder and former editor of Socialbrite, is co-founder of Cruiseable. Contact JD or follow him on Twitter or Google Plus. I am a busker (street musician) in NYC. I found your article very interesting, as "millions" of people videotape me every day. (presumably) the performer he has not "fixed" (eg., recorded) his performance in a "tangible medium of expression"
Most of the buskers I know ( – and I know many buskers…) have recorded their music on CDs (which they sell while busking or on line). In my case – I ask that people who blog about me put a link to my website (http://www.SawLady.com ) from their post/video. there is generally no copyright interest in a street performance because (presumably) the performer he has not "fixed" (eg., recorded) his performance in a "tangible medium of expression" (eg., a videotape, or computer disk). 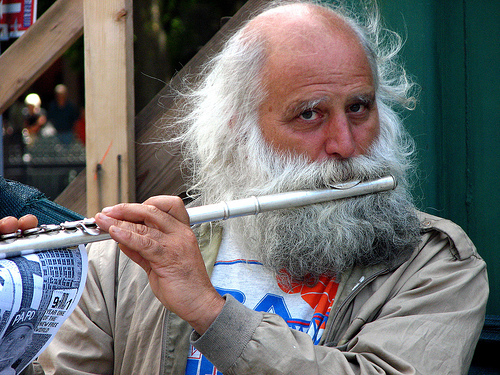 Most street musicians today have recorded their music – they sell it when they play on the street or from the Internet. Many street musicians also play music they composed and they own full rights for it. Saw Lady, you're super-smart to be marketing your site during your performances, and anyone who blogs it should certainly include a link so that they're helping you out! Michelle, CDs and Internet downloads are indeed fixed forms of expression, so copyright applies to those forms.